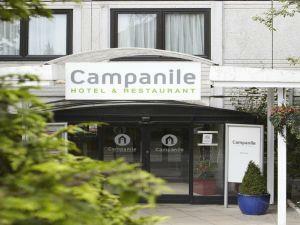 Campanile Bradford0844 8005789work08446 654 635fax HotelJust off the M606 motorway and with great access to the region’s major road network, the Campanile Bradford offers Wi-Fi, free parking and comfortable accommodation at great value rates. The hotel is conveniently located just off the M606, between Bradford and Leeds city centres. The proximity to the area’s major roads makes the hotel a great base, whether you are passing through, visiting either city on business, or exploring the surrounding region for leisure. Bradford Interchange and Forster Square railway station are just 4 km away and Leeds Bradford International Airport is only 13 km away. Just off the M606 motorway and with great access to the region’s major road network, the Campanile Bradford offers Wi-Fi, free parking and comfortable accommodation at great value rates. Conference facilities for up to 300 delegates. Smoking bedrooms available. Children welcome from any age.